We are the global hub for connecting people to learn, apply, and amplify Appreciative Inquiry. Learn more. Appreciative Inquiry methods help businesses and organizations create positive growth by elevating their strengths, building off what IS working, and generating collective energy and passion! Learn more. Bring appreciative skills and tools into your life and leadership. Check out our full range of educational programs and certifications! Learn more. Could your organization benefit from appreciative growth? Let us connect you with an AI expert. Learn more. Connecting with others sparks energy and creates possibilities! We are involved in hosting a number of gatherings every year so our community can meet face to face. Learn more. Learn to flip negative conversations, fuel productivity and meaningful engagement, and ask questions to ignite innovation! 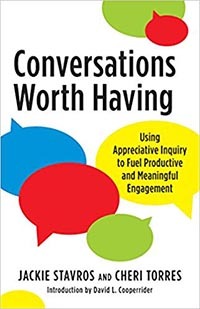 Conversations and Strategic Conversations Bootcamps, presented by Jackie Stavros and Cheri Torres May 29-31, 2019 in Burlington, VT. The David L. Cooperrider Center for Appreciative Inquiry, based in the Robert P. Stiller School of Business at Champlain College, is the global hub for connecting people to learn, apply, and amplify Appreciative Inquiry. AI is a way to discover and accelerate individual and organizational strengths. A shift toward an appreciative mindset, within oneself and across systems, can generate both individual and organizational value. How might I learn? We offer a full range of educational programs and AI certifications. How might I apply? We connect companies and organizations with AI experts who can help design and facilitate positive organizational growth. How might I amplify? We maintain the AI Commons and co-publish the AI Practitioner Journal, to encourage sharing research and case studies highlighting Appreciative Inquiry. As the global AI Community Hub, we bring together people and organizations who practice Appreciative Inquiry. As secretariat for the World AI Conference, host for the AI Jam, and co-convener of large scale system change projects like the World Positive Education Accelerator, we believe connecting with others elevates and accelerates generative possibilities. Interested in learning more about AI? Want it to help you or your organization grow in positive ways? Have research or real world successes to share? Contact us at (802) 865-8457 or at appreciativeinquiry@champlain.edu.